SUMMARY: Tribune Interactive offers targeted interstitials appealing to specific behaviours exhibited by potential subscribers, making acquisition easier and less intrusive. As users have become increasingly irritated by entrance interstitials, many brands are exhibiting caution when deploying them for subscriber acquisition or e-mail capture. But, by coupling a targeted, customer-based marketing approach with behavioural interstitials, Tribune Interactive has reaped great results in an inventory-efficient, less-intrusive manner. Bounce Exchange is our vendor of choice for these behavioural marketing assets. It provides a turn-key service that allows us to deploy behavioural overlays for 10 properties with little IT overhead. Our marketing team directs creative and partners with BounceX to set goals and strategy. Interstitials can be an effective marketing tool if used appropriately. Triggered by exit intent or page depth, behavioural overlays are less disruptive to the user’s site experience than traditional on-entry interstitials. The audience is divided into high, medium, and low cohorts, based on several factors including site engagement and intent to subscribe. By targeting only those users who meet certain thresholds of site engagement and display specific behaviours, we are able to maximise conversion rates while deploying far fewer ad units. This segmented, customer-based approach allows us to serve the right message for the right person at the right time to meet a broad range of business objectives, including subscriber acquisition, e-mail capture, and ad revenue growth. The most highly engaged users have displayed subscription intent. They have reached the checkout form but failed to complete the purchase. This segment of the audience presents the most immediate opportunity to generate direct subscription revenue. For this cohort, exit interstitials play an important role in driving conversions. Exit interstitials are triggered when the user’s behaviour on the check-out page indicates the intent to exit. This capability allows us to communicate with the user at the moment when she has displayed the greatest level of purchase intent, but has also displayed hesitancy. A subscription overlay served at this point forces the user to pause before abandoning the checkout funnel. It provides us the opportunity to address her indecision and perhaps offer a richer offer to prompt her to complete her purchase. Surfacing the correct offer here is important. 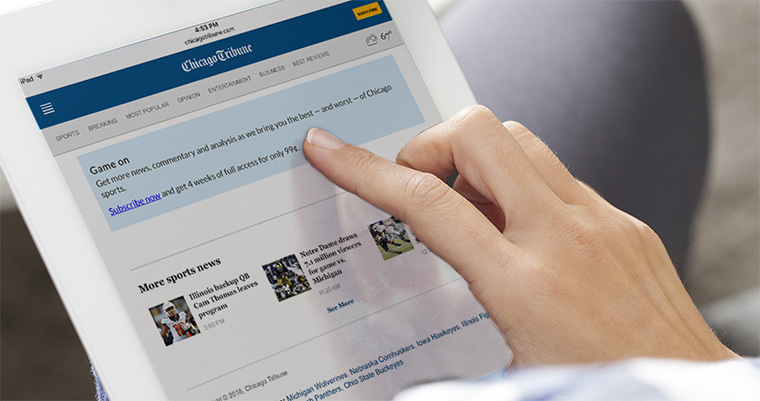 For example, early on we found that when presented with an exit interstitial that simply repeated the offer already on the landing page, 3.5% of users would subscribe to the Chicago Tribune. However, switching to a richer offer more than tripled the conversion rate from this group. Behavioural overlays are also more efficient for limited-time subscription promotions. Rather than indiscriminately serving non-subscribers an on-entry sale interstitial, this alternative overlay targets only those users in the “high-intent” cohort. The old method meant a consumer was often served a sales message before she even interacted with any of our content; the new method ensures the user has finished reading several articles before being propositioned with a subscription offer. By displaying when the user reaches the bottom of the article, the behavioural overlay appears at a more natural time in the user’s journey, when she already has a better understanding of the value of a subscription. The result is far more efficient. For example, during a holiday sale, it took 16,000 on-entry interstitials to yield a single start compared to only 1,400 behavioural interstitials for the same campaign. That translates into millions fewer interstitials over the course of a sale across Tribune Interactive markets. For the “medium-intent” cohort, behavioural interstitials are used to prompt e-mail enrollment to one of our free newsletters. Overlays are customised for the content category in which the user has displayed interest. For example, a user may be prompted to sign up for a Chicago Tribune sports newsletter upon his completion of a White Sox article. The ability to segment the audience in this manner allows us to serve the most relevant message to a specific user at that moment, thus increasing the e-mail submit rate. For the lowest-intent cohort, exit interstitials featuring paid ads provide an added revenue stream and a way to monetise a site visit from users unlikely to subscribe or sign up for a newsletter at this time. This additional ad inventory is filled by Bounce Exchange. The highly customisable targeting capabilities of these alternative onsite assets also give us the freedom to test new ideas. In addition to the main business objectives discussed above, behavioural interstitials have been used to promote site features such as free photo galleries on New York Daily News, highlight content such as the Dirty John podcast, cross-promote publications based on the visitor’s geolocation, and A/B test the price of a new standalone e-newspaper subscription. By leveraging behavioural interstitials targeting distinct audience segments, all of these marketing initiatives have seen success with greatly increased efficiency and greatly reduced disruption to the user experience. Kimberly Bastin is senior manager of onsite marketing at Tribune Interactive, publisher of Chicago Tribune, New York Daily News, and other publications based in Los Angeles, California, USA. She can be reached at kbastin@tribuneinteractive.com.